NOW Orange Essential Oil is typically used for aromatherapy. It has a fresh, sweet orange peel aroma and is known to have refreshing, invigorating, and uplifting attributes. Try "Exotic Nights" or other recipes using Orange Oil. Excellent value for a high quality product. I use this to get rid of ants: in a vinegar solution, on its own, and along with a peppermint oil/orange oil vinegar solution as well! I use orange in the bathroom with oil reeds. It leaves a zesty citrus scent 24/7. I use about 5 drops of orange oil with warm water, 1/2 cup vinegar and a few drops of uncented dish detergent as a cleaning/dusting product. Fresh clean smell fills the house. I stopped using scented dryer sheets and liquid downy. I now use vinegar in place of liquid downy and add 7 drops of this orange oil to the vinegar. I use wool dryer balls in place of dryer sheets and add 7 drops of this orange oil to the dryer balls. Much safer than all the chemicals in the other products!!! Fantastic smell! Great for DIY - I put this in my homemade surface cleaner and the smell is divine! Also smells great when deodorizing my rooms with baking soda. Love the fact that it comes in a big bottle and the price is affordable. I love this essential oil! It's affordable and works great with my oil diffuser to safely make my home smell like fresh cut oranges. Love the smell!!! Every morning I put a few drops on the bottom of the bath tub and when I shower the steam filled vapour gives me a great pick-me-up to start the day. Great price and quality! I use it to make my own home clean products .Smells lovely!! Beautiful! I love orange essential oil. I usually mix it with a few other oils in my diffuser. The only problem with this size though is that the bottle doesn't come with a proper dropper at the top of the bottle. It pours out quickly and all over the place. All of the essential oils I purchase from Well.ca are my favorite. I use all of them in my homemade cleaners and my clients love it! Smells amazing in a diffuser alone or with some NOW peppermint oil! Just for reference it does not have a dropper at the top. This is another great product by now it This smells so good you want to eat it, great for lotions, creams, and I use it in my ceramic terra-cotta diffuser in my bathroom & my bathroom smells wonderful. I use orange essential oil mainly in my aromatherapy practice. 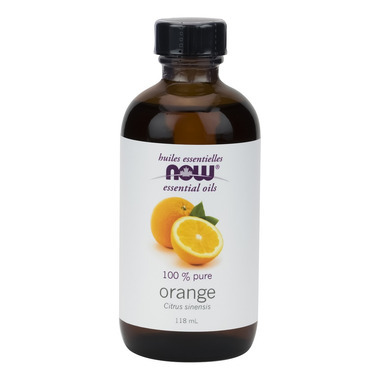 As with most citrus oils, this is a great mood uplifter and stress eliminator. I also add it to my lip chaps or body moisturizer for an extra boost! I use many NOW products, and this oil did not disappoint!